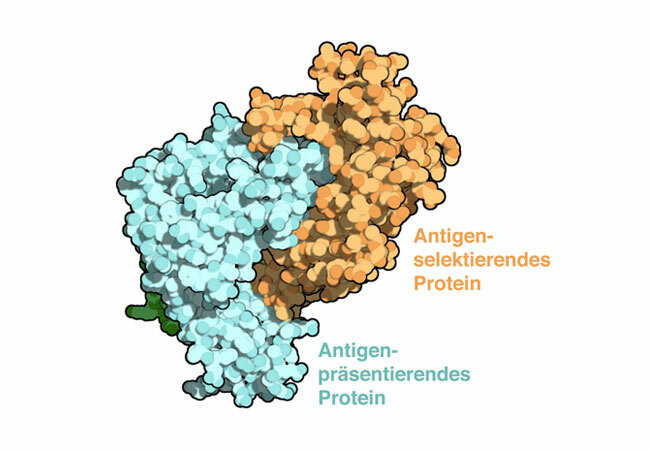 Science publication describes quality control of antigens. The immune system monitors the health status of the cells in our bodies by examining a kind of molecular passport. Sometimes cells present the wrong passport, which can lead to autoimmune diseases, chronic inflammation, or cancer. In the new issue of the journal „Science“ (first release), scientists of the Goethe University Frankfurt have now elucidated the mechanism of how the correct molecular passport is selected. Most cells provide the T cells of the adaptive immune system with information about their condition by presenting selected components of their interior (antigens) on their surface. If these components include fragments of viruses or altered cell components, the affected cell is eliminated by the T cells. The selection of the antigens is crucial in this process. Presenting the wrong antigens leads to either healthy cells being attacked by the immune system – causing autoimmune diseases or chronic inflammation – or to diseased cells not being recognized, allowing cancer cells or virus-infected cells to escape immune surveillance. „Our work solves a 30-year-old problem of cellular immunity, in particular how antigens associated with tumors or pathogens are selected through processes of editing and quality control in order to generate a specific immune response“, explains Prof. Robert Tampé the significance of the publication.